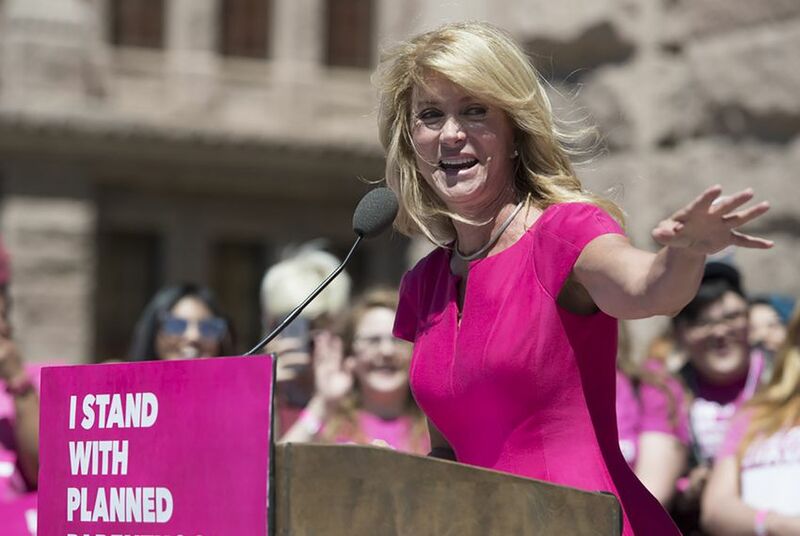 Almost four years after Democrat Wendy Davis’ failed bid for governor, the Texas Ethics Commission has fined her campaign and Battleground Texas for the delayed reporting of $3.4 million in political contributions. Neither the campaign nor the political organization admitted doing anything wrong, and the commission conceded the situation “is not explicitly addressed by Texas law.” Nevertheless, the Davis campaign and Battleground Texas each agreed to pay a $3,000 fine. Working together in the 2014 campaign, the groups employed an unusual fundraising arrangement, collecting political contributions through the “Texas Victory Committee — a Joint Project of Wendy Davis for Governor Inc and Battle Ground Texas.” That outfit — TVC — split its spending and its proceeds evenly between Davis and Battleground. During the second half of 2013, Davis and Battleground hosted “at least eight joint fundraisers,” the commission said in its orders. TVC reported those contributions and the fundraising costs in its January 2014 report. But it didn’t transfer those contributions to Davis and Battleground until March of that year. Both reported the transfers in their July 2014 reports. The commission said the contributions should have been reported six months earlier, when the donors’ checks were cashed. “The effective control over TVC and the donor’s intent support the finding that Battleground and Davis PAC constructively accepted the funds when received by TVC,” the commission said in its orders. As a result, it said, each got “about $1.7 million” that should have been reported in January and wasn’t reported for six more months. It caused a fair amount of confusion during the campaign, creating the impression for some that donors had given twice as much as they had, since their contributions showed up under their names in the TVC report in January 2014 and then again in the Battleground and Davis reports in July 2014. That said, the commission said the reports filed by the two “evinced a good-faith attempt by the respondent to comply with Texas disclosure laws for a somewhat complicated and novel fundraising operation not explicitly contemplated by Texas law.” It was clear, TEC wrote, that money given to TVC was bound for Davis and Battleground, that TVC reported its contributions and expenditures, and that the other two eventually reported what they received. Neither Davis nor Battleground “admits or denies” those facts and conclusions, the commission wrote, but they agreed to pay a $3,000 “sanction necessary to deter future violations” and to let the TEC post the orders.